Just like Merlin, Maxine still nurses from her mom and eats fish too. Dolphin calves typically nurse from mom for as many as 3 to 6 years or until mom has another calf. Besides spending much of her time with her mother, Maxine also spends a lot of time playing and socializing with the other young dolphins her age: half-brothers Merlin and Magic. She also has a close relationship with 13 year old Noelani. It is quite common for young females like Noelani to want to spend time with young calves and this is how they gain experience for when it’s time for them to have a calf of their own. 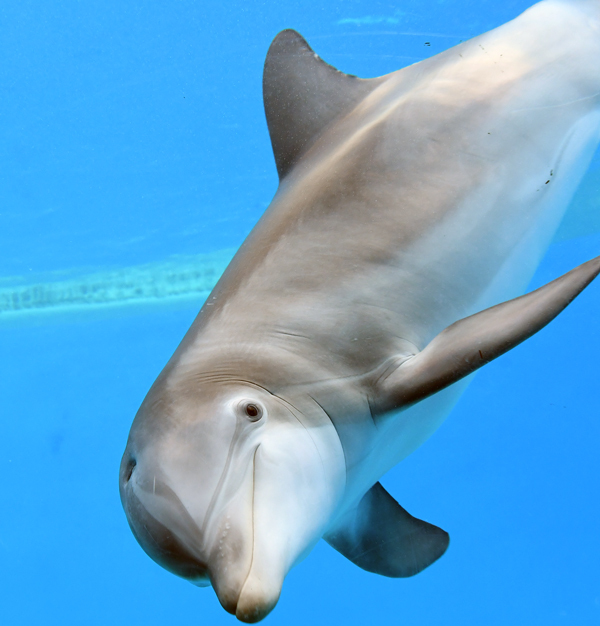 As the youngest of the group, Maxine is one busy little dolphin. She also has a larger-than-life personality and is learning many new behaviors. Like her half-brothers, she is learning how to participate in her own health care as well as other fun behaviors. The marine mammal care team has found that Maxine is very creative! One of her favorite things to do is when the team ask her to do whatever behavior she would like. It’s during this time that her “ants in her pants” energy and creativity shines through. She takes off and you never know what she is going to offer...but many times she likes to jump in the air and spin. So maybe the next time you visit Seven Seas at Brookfield Zoo, keep an eye on Maxine to see what she might doing next!